The Classic Piano Collection sample libraries must be purchased separately. 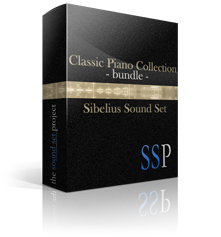 This product facilitates use of the Classic Piano Collection libraries in Sibelius. IT IS NOT A SAMPLE LIBRARY and DOES NOT CONTAIN ANY SOUNDS. To purchase the Classic Piano Collection libraries, please visit the Native Instruments website. Classic Piano Collection, Berlin Concert Grand, New York Concert Grand, Upright Piano, and Vienna Concert Grand © Native Instruments GmbH.